The European Commission provides funding through City-zen for energy efficient home renovations. Amsterdam Smart City is looking for inspiring and innovative projects in Amsterdam. 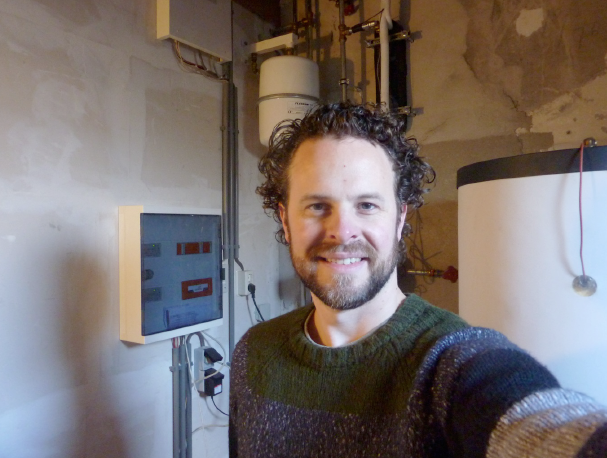 Some residents have already taken this step, like Wigger Verschoor from Amsterdam North, who has almost completed his home energy efficient home renovation. Wigger Verschoor alongside his energy-efficient heating system. Photo W. Verschoor. Clockwise. Above the control of the heat pump (which is on the roof) and the expansion tank. Right the buffer vessel, and completely left the monitoring. ‘Practice what you preach’. I work at Urgenda (The Urgenda Foundation aims for a fast transition towards a sustainable society with a circular economy). As Projectleader for ThuisBaas we work towards zero energy of existing homes in Zaandam, a city close to Amsterdam. Did you consider the idea of retrofitting your home, for a long time? Yes, but I waited until we decided to buy and move to a another house. Once you start remodelling, the decision to retrofit and include energy-saving measures is a logical choice. My reason to energy efficient renovate is however more substantive than financial. Experimenting in an Amsterdam situation, replacing gas with electricity, that made it really interesting. Thanks to the City-zen funding I was able to take that extra step. What energy measures are you most proud of and which measures have the greatest impact? We have chosen for new window frames with HR ++ in our home. And to become truly energy efficient, we opted for smart solutions such as an air-water heat pump (with a large buffer vessel of up to 400 liters) and smart radiators. I am most proud of the advanced cascaded heating system of the heat pump, which probably provides the best returns. How much money have you invested in total in the renovation and in the energy saving measures? The renovation cost about € 35,000. As it was a “shell” house so we had to install a kitchen, bathroom, ceilings and floors. The energy-saving measures cost around € 25,000 euro, including the new window frames. The City-zen grant was € 6,300. How much you save on your energy costs? I can start calculating in August 2016 once I live in my house for one year exactly. And next year, once the new window frames and double glazing is in, then I will calculate again. With the emphasis that there are always variables you need to take into account. I recently became a father, which means you spend more time at home, these things obviously have an effect on energy bills. What are the learning opportunities and tips for others? It is very important to find a contractor and installer who is knowledgeable and trustworthy, with a good track record and who works with specified prices. You’ll ask other people for advice and read up about renovations. It takes a lot of time and energy, but you also get a lot in return!